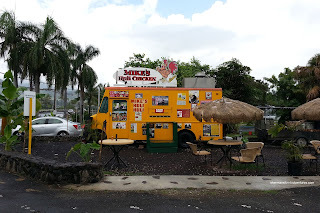 Call it the curse of the Triple-D's or my daughter's obsession with the Food Network, but we made the drive out to Mike's Huli Huli Chicken out in Kaneohe. Could it be that good that it made Guy Fieri salivate? Or is it another one of those over-hyped places that all tourists flock to? I guess that was another determining factor in our planned visit. Well, Mother Nature didn't seem to agree with us as the skies opened up and almost made it Mike's rain-soaked chicken. Of course, our first dish was the Quarter Chicken Plate with green salad and rice. 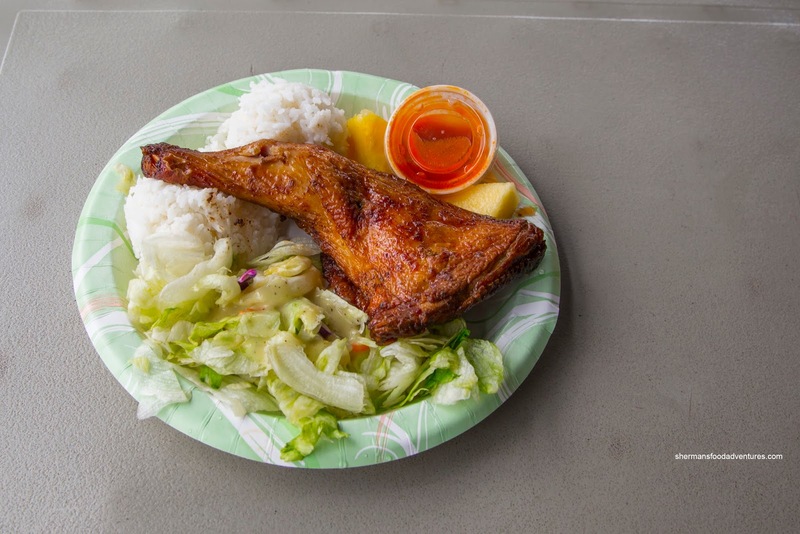 Being the namesake of the place, there was a lot riding on the broiled chicken leg. In actuality, it was pretty good as the meat was brined which resulted in succulent and well-seasoned chicken. The skin was nicely rendered and spiced which meant no other sauces were needed (but the side of hot sauce was provided). Did it blow my mind? No, but it was still very good. Now we couldn't say the same for the 2 Pork Combo consisting of char sui and Kalua pork. The char sui was disappointing as it was dry where some pieces were tough and chewy. It was rather one-note too as it was predominantly sweet. 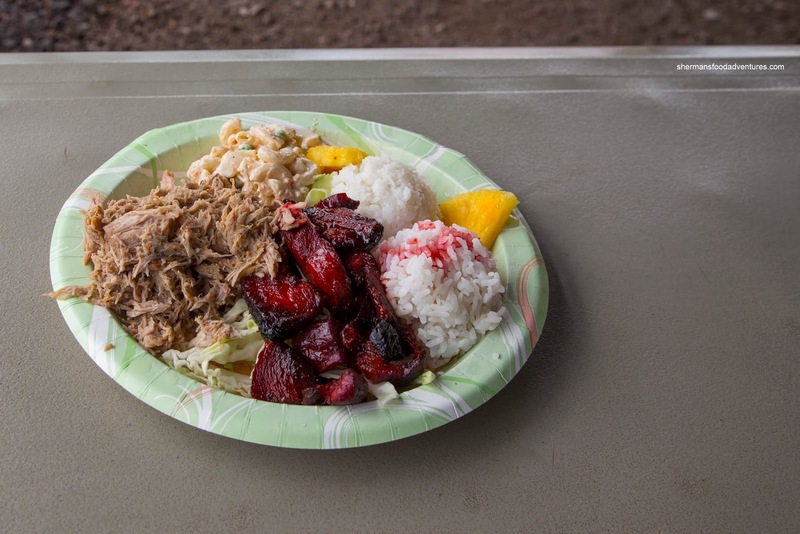 The Kalua pork was better, however, it was dry as well. Our last plate was the Ahi Tuna and Garlic Shrimp with mac salad and garlic butter rice. Although fully-cooked, the tuna was not terribly dry. It was adequately seasoned where there was nice acidity to go with the savoriness. Surprisingly, the best thing we had was the shrimp as they were large and beautifully prepared. The barely cooked shrimp exhibited a buttery snap while drowning in an addictive fresh garlic butter. Although sometimes considered an afterthought, the side of mac salad was on point with firm noodles mixed with just enough creamy dressing. So was Mike's a tourist trap? I would say no. 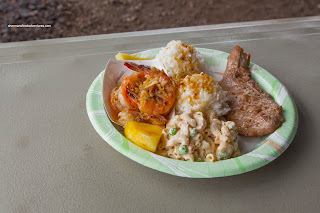 The food was decent enough including the surprisingly on point shrimp.